Is Stalking Candidates Worth the Risk? We've all heard the tales of a terrific job candidate who appeared to be a sure bet until hiring managers went snooping around the applicant's Facebook page. Maybe there were pictures of the candidate smoking what might be marijuana or posts that seemed to betray his inherent sexism, racism or violent tendencies. Whatever the managers saw on the applicant's social media site convinced them the candidate was not as suitable as he appeared in his interview. As a result, someone else got the job; presumably someone smart enough to protect his Facebook page from public views or was simply not popular enough for drunken hot tub pics. As much as these stories are bandied about, the reality is that losing an employment opportunity from corporate prying is actually quite rare. In a number of surveys, HR managers have consistently indicated that although about 76% use social media sites to attract applicants, less than 20% use these forums for vetting purposes. Of those companies that do troll social sites for screening candidates, most admit finding a 'deal-breaker' post or image is exceedingly infrequent. For some companies, rejecting the use of social media in the screening process is simply a philosophical decision that such invasiveness is inherently wrong They see it as tantamount to spying on an individual who is not yet even an employee and these firms want no part of it. Additionally, employers should be aware that using social media for screening purposes is ultimately unfair to all candidates and to their own business. After all, statistically, only about half the applicants for any job will have a social media account of some sort. Do you reject unsearchable candidates or will Internet invisible applicants get an advantage due precisely to their lack of visibility? Either way is fraught with peril. You neither want to limit your applicant choices by half, nor give a boost to someone just because they lack a presence on the Internet. For other businesses, however, the reasons for refusing to engage in this practise are much more practical. Not only can such prying be viewed as morally repugnant, and, therefore bad for your brand, it can lead to legal difficulties. A person's resume is usually free of information such as age, marital status, race, religion and other factors that might lead to discrimination against an applicant A person's Facebook page, however, has no such constraints. Hiring managers who uncover information they are not entitled to are inviting expensive litigation, whether they use that information or not. Another liability risk is that a person making the employment decision could ignore information revealed by a candidate's social media content. In the event of an act of violence against another employee, the company could be sued for 'negligent hiring' if there is evidence on the new hire's social pages suggesting that possibility exists. If the managers had stayed away from the job-seeker's social pages, however, they would be able to claim plausible deniability. As well, people who are making the hiring decisions often get scores, if not hundreds of applicants for a single job. Trying to review the social media accounts of all those people would be time consuming and, in light of the dearth of 'smoking gun' type content, is a rather inefficient use of resources. What to Do If You Just Can't Help Snooping? Ensure the person who will be making the hiring decision is not the same person who will be reviewing social media sites. The person checking social sources should be an HR professional well versed in hiring legalities. They must be careful to provide to the decision-maker only the information gleaned from the applicants' sites that the company is entitled to know. 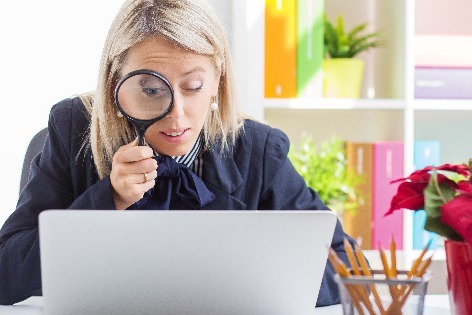 It is imperative the information shared by the HR rep is well documented and properly archived to avoid problems in case the prospective employee's sketchy content is altered or deleted before a lawsuit is filed. Social media monitors should stick with examining only sites designed for professional networking use such as LinkedIn while avoiding platforms more related to socializing such as Facebook. For the vast majority of companies, the complexities of using the scant information harvested from their candidates' social media accounts is simply not worth the effort or the significant risks. There are safer, better tools for gaining insights into a person's employability than stalking them on Facebook.